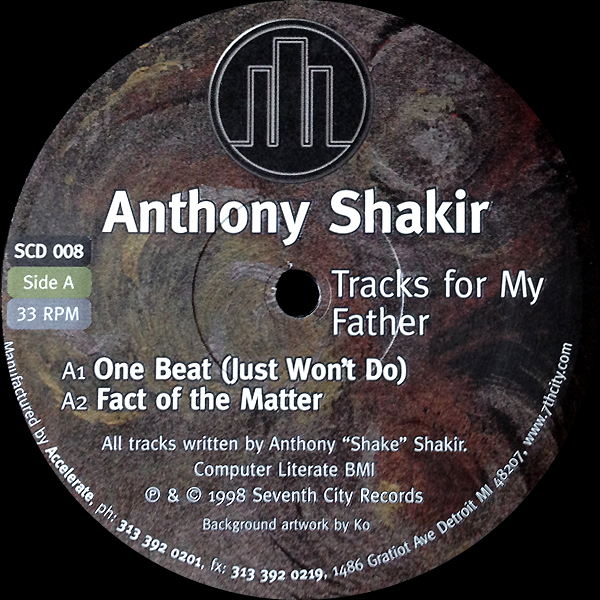 Tracks For My Father is the first Anthony Shakir record I ever owned, having picked it up nearly twenty years ago. I remember finding the 12" in the cutout bin (at the old record store next door to Club Elements) while digging with Snakes after school one crisp Autumn afternoon. I'd heard of Shakir before but hadn't yet heard his music, and with its evocative imagery (on Daniel Bell's 7th City imprint) and $1.50 price tag (which even to a broke high school kid isn't an awful lot of money) it seemed like the ideal place to start. When I took the record home and put the needle 'pon the record, the effect was like a hidden door opening somewhere in the back of my mind. I hadn't heard anything remotely like it. Fractured beats seemed to tear open cracks across the shifting surface of their own skittering rhythms, cracks through which bass, synths and texture poured out over it all like molten soul. 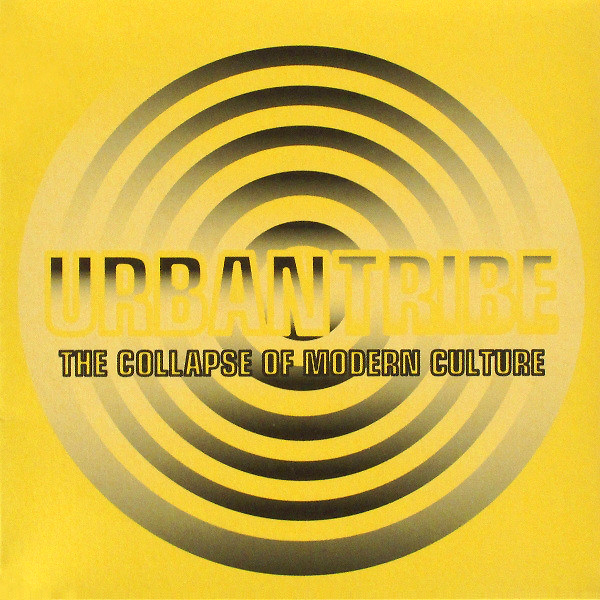 Nowadays you might call it broken beat, but at the time this malfunktioning, hip hop-inflected techno soul felt like the missing link between contemporary Timbaland and Kenny Dixon, Jr. The good good, in other words, and to this day it remains my favorite record by old Anthony "Shake" Shakir. My thing was trying to learn how to make music and the only reason I got into electronic music was that the early 1980s R&B just sucked. I didn't like the last Parliament record, Trombipulation, so I started finding out about these other records. I've always liked this quote because it's at the axis of r&b, techno and house that Shake's music pivots, placing him firmly within the context of machine soul's protracted development. Centrally, in fact.2 In many ways, Tracks For My Father is like UR's The Turning Point, unfurling four sprawling movements that draw inspiration from the rich grooves of vintage jazz, funk and soul even as they manage to augur uncharted futures of their own. The record opens with the deranged synths of One Beat Just Won't Do shearing into focus. It sounds like the machines are warming up as those synths cycle in and out of range, and then the front door opens and you're dropped out into the world. Submerged in the sounds of the city, now you're shuffling down the sidewalk, alone among the teeming masses. The words One beat, just won't do, ring out from some car stereo passing by, the words hanging in the air on repeat. You weave through the pedestrians, all on journeys of their own, while cars negotiate the traffic on the rain-slicked streets beside you. Drums cycle in a stop-start rhythm, matching your movements as you juke your way down the boulevard. Beats punch in and out of that still-looping chorus like one of Theo Parrish's MPC workouts (with his deep house vibes subtracted and shot through with a sort of skewed electro-jazz hip hop flavor). Then, the vocals cut out altogether and a warped organ hangs over the beat like a fog, before the beat vanishes as well, synths and organs twisting in unison eight feet above the ground. Yeah Joe, you know, we were talking earlier — just before we started this — that we've seen the business go from really creative music, you know, to corporate business control. Well, how do you feel about that? They vanished. And they have definitely changed the culture. And you know I love the big business too. I love paychecks and all of that, but if the culture has got to suffer... the musical culture, the enormous contribution that we gave to the world in the 20th century, then I say nuh-uh they just kinda screwed it up a little. Without warning, Fact Of The Matter kicks in with an electroid slab of skewed, introspective techno. In a sense, it's the most conventional track here, perhaps even reminiscent of something like Live For Friction (from the Iconoclastic Diaries EP). You've arrived at the club, once again weaving through a crowd of people, this time veering toward the bar to order your drink and then proceed to the dancefloor. An archaic synth progression pulses from the soundsystem, all warmth and silicon soul, scattering stardust across the room before it gets sucked back into its own vortex again. That mutant electro beat still taps out its rhythm while a deep six bassline seems to jump rope across its surface. 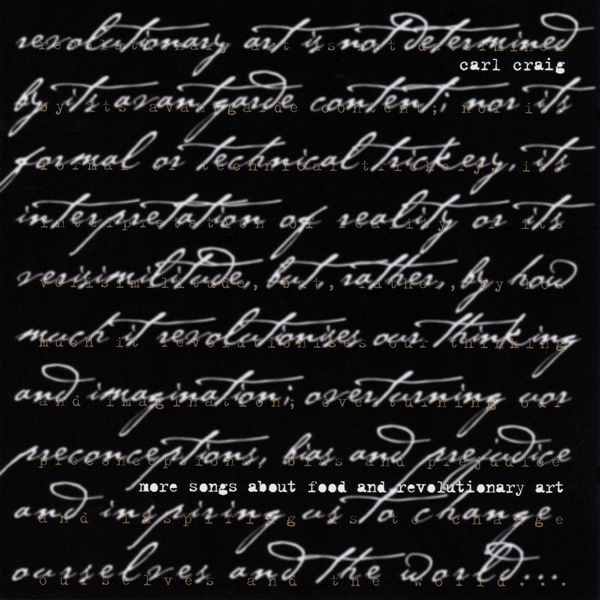 One's reminded of Carl Craig's masterful More Songs About Food And Revolutionary Art and its fizzing electronics, those gentle computer rhythms cycling like clockwork in the night. No surface is constant, no measure unchanging, as textures move in and out of phase as if viewed through a prism. Rhythms rewind and slip into eddying tide pools — where only a flickering bassline accompanies the synths — before flowing back into the slipstream once again. 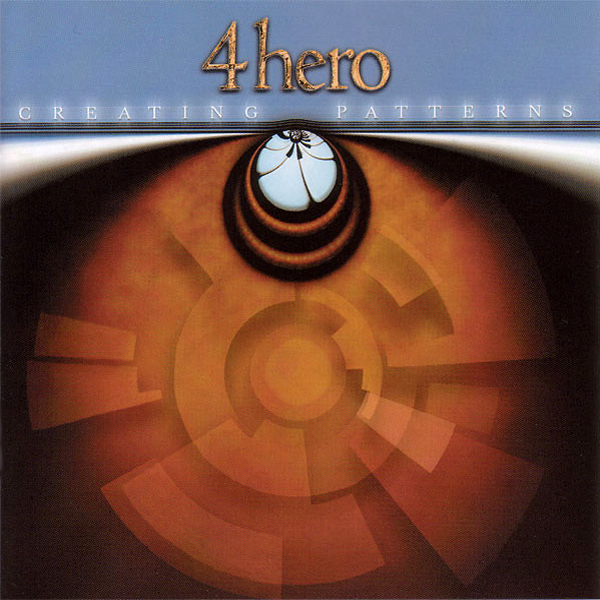 Like Kraftwerk remixed by Kenny Dixon, Jr. the whole thing just unfolds like sonic origami. The one thing that we did find — as you know — in traveling all over the world, the one level of communication that we had that overcame language barriers and everything else was the music, you know? And now that — and you know — and of course the corporate world ain't gonna like this, but I'm sorry this is the way it is: the corporate world stepped in and took away the creative process, and started making it the financial process. Drifting in on a silicon haze, Travelers is by far the most ethereal thing here, its gently flickering shadows quite minimal even in the context of this record's brooding, cracked jazz soundscapes. Celestial synth textures phase in and out of earshot like a hazy morning mist. You're shuffling homeward back down these same city streets — by now nearly deserted — and you can just begin to see the first glimmer of sunlight on the horizon, bathing the face of certain eastward facing buildings even as you roam the darkness below. A pulsing synth pattern seems to bounce along the center of it all like a coiled spring, while a simple keyboard melody plays gentle counterpoint deep in the distance. The drip-dropping percussion enters subtly, splashing into focus like footsteps upon the rain-slicked sidewalk. Everything seems to drift in and out of focus, threatening to crumble into dust even as it staggers ever forward, taking you home to your front door once again. And then, our journey ends. Over in the space of twenty-five minutes, this four track EP hits you like a vintage soul album in miniature (albeit shot through with a healthy dose of Future Shock). Part of the reason this record means so much to me is that it seems to cram a whole double-LP r&b song cycle's worth of ideas into the space of four tracks and two interludes. Submerged beneath its deceptively simple surfaces are hidden vast corridors left for you to explore, reaching deep into the past even as they uncovers possible futures. 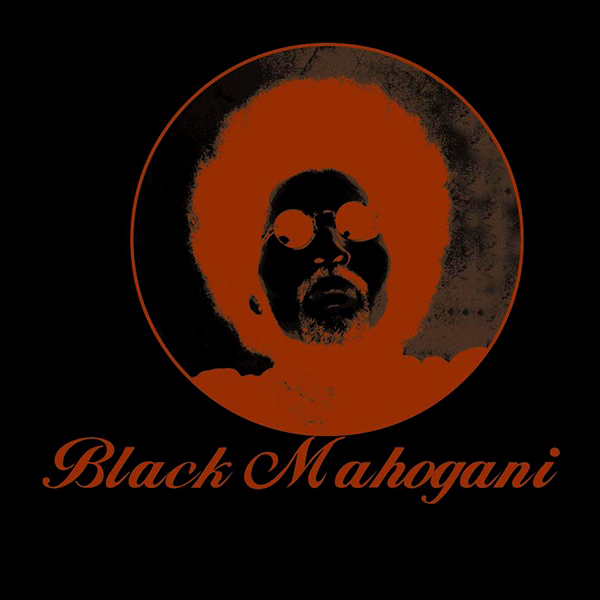 The record seems to fuse the sensibility of Moodymann's Black Mahogani with the x-ray electro of Drexciya's Neptune's Lair and 4 Hero's jazz-inflected stone tablet Creating Patterns. Of course, none of those records had even come out yet, which further highlights the record's singularly visionary nature. The sound and spirit of Tracks For My Father have everything in common with the music of 21st century figures like SA-RA Creative Partners, Kelela, J Dilla, Erykah Badu, Kamasi Washington and Kendrick Lamar. In other words, music that we're still catching up with. 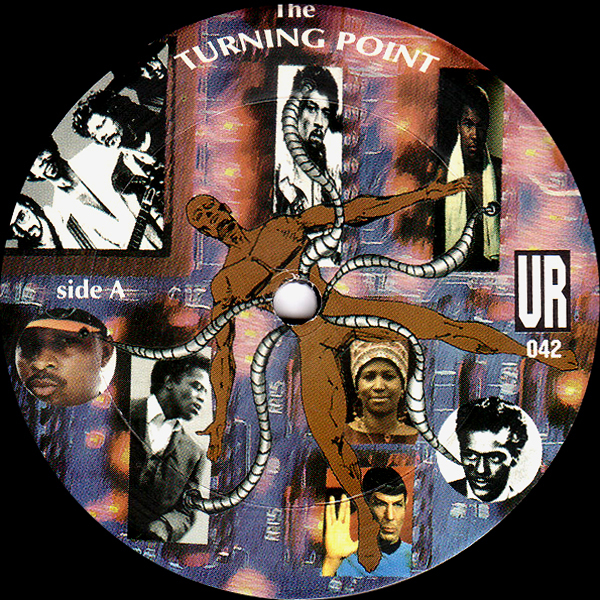 Tracks For My Father springs squarely from the very particular environment of late-nineties Detroit, an era when records like Urban Tribe's The Collapse Of Modern Culture (which Shakir had a hand in developing) and Innerzone Orchestra's Programmed were fusing techno with the twin spectres of progressive soul and jazz. It's a world that remains quite tantalizing to this day, evoking images of Blade Runner intercut with Detroit 9000 in its Future/Past negotiation. I remember even at the time thinking that this record is what the future would sound like... now wouldn't that be something if that someday turned out to be the case after all. Sicko, Dan. Techno Rebels. New York: Billboard, 1999. 86. Print. Characteristically, Shakir played a key role in the production of Octave One's I Believe, machine soul of the highest caliber. The other reason for the (deep) space between posts is some significant developments going on behind the scenes at the Parallax Room. You may have noticed that the archives have been augmented with enhanced multimedia content, and that's just the beginning. We're in the process of transforming this space into something far more accessible, with content mapped out of its current linear structure into an encyclopedic archive of material delving deep into the heart of vibed-out beats and related words therein, in orbit of atmospheric, street-level moods and grooves. Stay tuned. Further developments are waiting in the wings.